Lucy makes her way to school despite rumblings all around. Getting her nose into a good book makes all the troubles melt away. She wears a checked school dress over a blouse/slip combo. She pulls her red jumper (sweater) on for warmth. 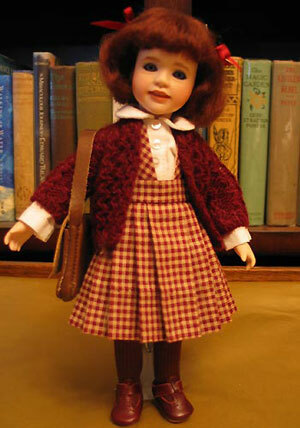 Lucy sports a a reddish brown mohair bob and has hazel eyes. Nanette attends finishing school. She’s learning manners, social skills, fine needlework and watercolors in addition to her studies. She’s dressed in a silk frock and jacket of cerulean blue, trimmed with gold striped silk organza and piping. 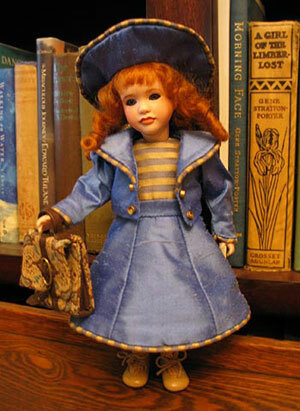 Nanette has red mohair curls and blue eyes.